There are 11 clinical trials and over 20 review papers which have been presented in 1,000's of medical meetings and conferences' world wide, including but not limited to fatigue, anti aging and metabolic syndrome. OPTI Factor is based on Lipid Replacement Therapy which has been shown to repair damaged cells. 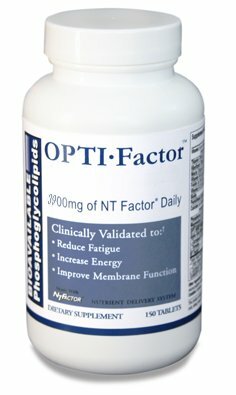 OPTI Factor is a custom formulation of NT Factor® with a mitochondrial fuel blend. Made up entirely of food and food extracts, it is just about the safest way to regain your youth. Opti Factor works by keeping your cells healthy, and fueling you're mitochondria, the powerhouse of your cells. The ability to convert food and oxygen to energy begins in your cells. Taken in combination with other nutritional supplements, it makes everything work better. Daily Vitamins Are Not Enough. We take vitamins for nutritional support and antioxidant protection but no vitamin can protect all of our cells from becoming damaged. Damaged cells can lead us feeling tired at certain times of the day. In many cases more severe fatigue or exhaustion is experienced. OPTI Factor with the NT Factor® nutrient compound is the only scientifically proven product to repair damaged cells. The NT Factor® nutrient compound has been shown to substantially eliminate fatigue and tiredness in pivotal studies conducted at UCLA, Henry Ford Hospital, The Institute for Molecular Medicine and others. One key study showed biological findings of cellular health of 70 year old people equal to that of individuals 35 years of age. One of the world's leading experts in cellular research considered this to be one of the most important medical breakthroughs of the 21st century and defined this as "Lipid Replacement Therapy". Taking OPTI Factor creates sustained energy levels - not just a few hour jolt like energy drinks or caffeine. True, Healthy Energy! Effective Protocol Enhancer | Does what vitamins can't do . . . Repairs damaged cells! 1 Month Supply | 30 day 100% "No Questions Asked" Guarantee! Important: Be Sure to Read Our Product Description Below | MADE IN THE U.S.A. If you have any questions about this product by Opti-Factor, contact us by completing and submitting the form below. If you are looking for a specif part number, please include it with your message.